A process is defined as a set of interrelated or interacting activities, which transforms inputs into outputs. Process approach is the application of a system of processes within an organization, together with the identification and interactions of these processes, and their management. The purpose of the process approach is to enhance an organization’s effectiveness and efficiency in achieving its defined objectives. Process effectiveness and efficiency are usually assessed through internal or external review processes. Effective design and management of key processes is an important differentiator and source of competitive advantage in the manufacturing as well as in the services. Processes permeate all facets of an organization. Some processes exist within one functional area, while others cut across functional areas. Process management is the application of knowledge, skills, tools, techniques and systems to define, visualize, measure, control, report and improve processes with the goal to meet profitably the requirements of the customers. Process approach to management is a powerful way of organizing and managing activities in order to create value for the customers and interested parties. Organizations are usually structured into a hierarchy of functional units and are normally managed vertically. In such organizations the responsibilities for the intended output rest with the respective functional units. The end customer or the other interested party is often not visible to those involved in the functioning of different processes. Hence the problems that occur at the interface boundaries do not receive proper attention and get lesser priorities than the short term goals of the organization. This results into actions being focused on the functions rather than on the intended output leading to little or no improvement for the customer or the interested parties. The process approach to management introduces horizontal management, crosses the barriers between different functional units and unifies the focus of the different units on the main goals of the organization. It improves the management of the process interfaces. The process approach is one of the eight quality management principles upon which the entire ISO 9000 series of standards is based. This principle says a desired result is achieved more efficiently when activities and related resources are managed as a process. Quality management standard ISO 9001 promotes process approach for the management. The processes are managed as a system, by creating and understanding a network of the processes and their interactions. The consistent operation of this network is sometimes referred to as system approach to the management. Each work involves a process which consists of things going in (inputs), getting worked upon (conversion), and coming out as products (output). The value adding conversion activity within a process transforms input into output. Process inputs and outputs can be tangible (e.g. raw materials or finished product) or intangible (e.g. information or service). Each process has a supplier, a customer and an owner. The supplier and customer may be internal or external to the organization. The process owner has having defined responsibility and authority to operate, control and improve the process. Every process needs resources such as people, equipment, materials, and technology etc. These resources can be inputs (raw materials or information) as well as the value adding conversion activity (use of machinery, equipment, technology, and people etc.) for transforming inputs into output. Every process has also to meet various requirements which may be specified by the customer or may be applicable regulatory requirements or may be the requirements of the organization. The performance of the processes needs monitoring to determine how they are performing. For this it is necessary to have various measurements of the parameters of the processes and the measured data needs analysis to know the effectiveness of the process. 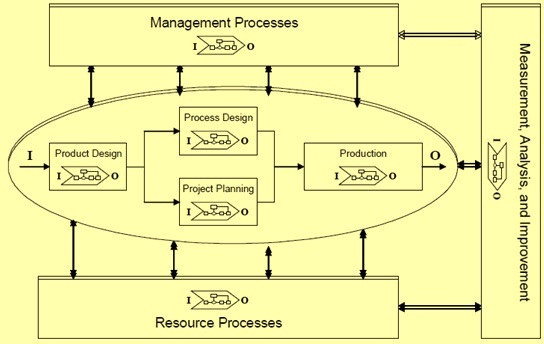 The main advantage of the process approach as compared to other approaches is in the management and control of the interactions between the processes as well as of the interfaces between the functional structures of the organization. There are several processes which are in operation in an organization for the purpose of its objectives. Though these processes may be unique for each organization, yet the processes can be broadly classified in the following types. Processes for the management – These processes include processes relating to strategic planning, establishing policies, setting objectives, ensuring communication, ensuring resources and carrying out management reviews of the performance of the processes. Processes of managing resources – These processes include all the processes that are necessary for providing the resources required for the fulfillment of the targets and objectives of the organization. Realization processes – These processes are those processes which provide the desired outcomes of the organization. Measurement analysis and improvement processes – These processes are those processes which are needed to measure and collect data for analysis of the performance and for the improvement of efficiency and effectiveness. These processes include the processes needed for measuring, monitoring, auditing, performance analysis and improvement processes. Measurement processes are usually documented as an integral part of the management, resource and realization processes while analysis and improvement processes are autonomous processes that interact with other processes, receive inputs from measurement results, and send outputs for the improvement of those processes. Processes in an organization can also be classified in the following way. Customer oriented processes – These processes includes processes for the determination of the customer requirement, for the production of the product needed by the customer, for delivering and servicing of the product, for determining customer satisfaction. These processes need maximum interaction with the external customer. Support oriented processes – These processes provide the necessary resources to customer oriented processes for facilitating product realization and include measurement and monitoring activities. These processes have normally had a large degree of interaction with the customer oriented processes at the operational levels. Management oriented processes – These processes provide the strategic planning, commitment, leadership, resources reviews and decision making. These processes usually interact with all the processes. Quality management processes – These processes interact with all the processes and provide quality management support to them. These processes include monitoring and measurement, records and document control, internal audits, control of non conformance, corrective and preventive actions, and continual improvements. Outsourced processes – The outsourced processes are those processes that an organization needs for its functional system and which the organization has chosen for getting them performed by an external agency. The process approach is one of the strongest approaches for integrating management system because each process must be managed and improved simultaneously for all process performance measures. Directly linking of process performance measures with customer needs is one of the most powerful aspects of process management. Many methodologies are available for managing and improving processes, but all share some simple basic elements. A simple process management and improvement methodology is often organized in a series of steps as described below. Step 1 – It is critical to have an overall process manager or process owner with end to end responsibility and accountability for all aspects of process performance. The process manager needs to understand the entire process and have the authority to effect changes in any part of it. Step 2 – The process manager and process management team need to carefully define the process so that everyone working within the process has a shared understanding of how it operates. How much documentation is required depends on such attributes as the stability and education of the workforce and the complexity and criticality of the process. All process inputs and outputs are identified, along with the suppliers and customers, who may be internal or external. The team also identifies process steps and flows. Step 3 – The process management team carefully gathers, analyzes and documents customer needs, including how customers use the outputs of the process. The team frequently communicates with customers to understand needs from their viewpoint. To the extent possible, the team defines measurable customer needs and ranks them in order of importance. The team also directly validates needs and requirements with customers. Step 4 – In this step the customer needs and requirements are translated into measures of process performance. This is one of the most important and difficult steps in the process management. This step Includes customer satisfaction, in-process measures and measures of supplier performance in process measures. The step relates all important customer needs, defect rates, product tolerances and worker health and safety issues etc. to the performance measures. Step 5 – In this step first the process performance measures are used for ensuring that the process is operating in a stable and predictable manner. Then the process performance measures are compared with the needs and requirements of the customers. Step 6 – The first five steps provide a basic methodology for process management. But the responsibilities of the process manager and process management team do not end there. A significant benefit of process management is its natural fit with process improvement. Once process performance has been compared with customer requirements, process improvement is the natural next step. The gaps in process performance and the customer needs are used to determine critical process improvement opportunities. The process performance measures are analyzed for improvement opportunities related to sources of such attributes as errors and defects, process simplification opportunities, process bottlenecks and lack of adequate process controls. Both process effectiveness and efficiency can improve as a result of process improvement activities. Many tools such as PDCA cycle exist to identify process improvement opportunities. Step 7 – The process improvement opportunity is selected that is to be pursued. This selection should take into account such attributes as the criticality of improvement needs, difficulty of improvement opportunities, and resources and expertise available. The process improvement teams are established to pursue specific improvement opportunities. Step 8 – The process team carry out the assigned specific improvements to the processes. The team is empowered to carry out the specific improvements and is provided necessary support of the resources.